How do I find out what version of PHP I have? After creating the file, Browse to your website. The version will be at the top. Why cant PHP include or find files? The portion of the path highlighted in red cannot be seen by PHP. The portion of the path highlighted in green can be seen by PHP. Where should files be published? Why is the max file upload size 2MB? The upload_max_filesize and post_max_size have small default values. This can be overridden in a few simple steps. First, create a hidden file named .user.ini under /public_html/var/www - Not to forget the dot at the beginning of the filename. After saving the file, your new limits should be in effect. Currently, We have 3 versions of PHP available. These versions are interchangeable. Please contact your ISP for information regarding changing versions of PHP. Why does the mail() function not work? What hostname should I use to connect to my webspace? To upload content from a mobile device, You will need an FTP client such as AndFTP. What is the FTP folder at the root of my webspace? All files placed or changed here will reflect the website in question. My client reports "This server does not support FTP over TLS". Currently, We do not support connections over TLS. If you would like an encrypted connection, SFTP is available. This is done by configuring your FTP client to use an SFTP connection, over port 22. This will utilize SSH to encrypt the traffic to and from your client. 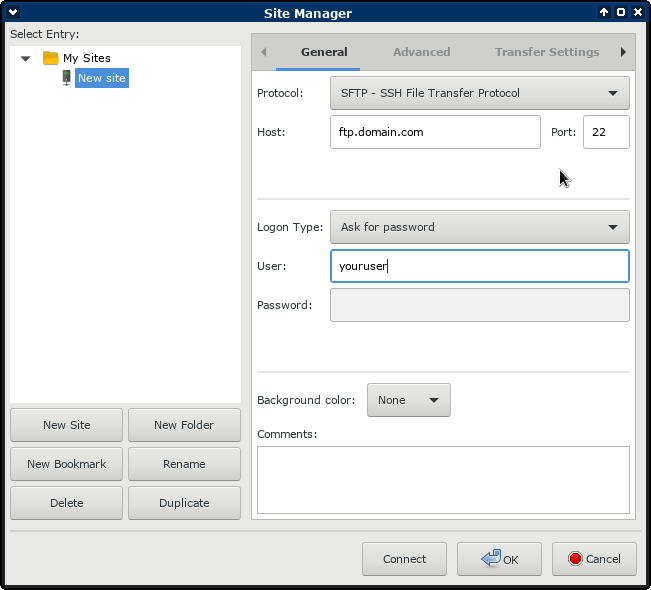 The SFTP option is usually located in the 'Protocols' drop down menu in common FTP clients. Below is an example screenshot. How do I know who hosts my domain? To find out who hosts your domain, You will need to do a 'whois' lookup on the domain in question. This is done by visiting a website such as https://whois.icann.org and entering the domain name in the search bar. Once complete, Look for the section labelled 'Registrar'. What is a DNS record, and how can I change/update it? Then that means Goldenwest is authoritative of this domain, and any changes made by them will reflect to all DNS servers around the world. If any other name servers are listed, Check with your registrar for a control panel. Most of them will include a panel to manipulate DNS records. When I browse to my site, I see a.. If you have an Index file, but are still seeing this message, Check the permissions of the public_html folder. The permissions might of been modified by an FTP client. The correct permissions for this folder should be (in octal format) 701, or Read, Write and Execute for the owner, Only execute for the 'Other' entity. Another not so common issue could be a misconfigured .htaccess file, that is blocking requests. This will be a hidden file, so your FTP client might need to be configured to view hidden files. "No input file specified" message. This error could appear when PHP is active on an account, But there is no index file within the document root. To fix the issue, Create a file named index.php under your document root. This also could mean PHP is trying to find a file that does not exist. Double check that your paths are correct, and that you are referencing the file from within the chroot environment. Refer to "Why cant PHP include or find files?" for more information. This error is most commonly seen when there is no PHP on the account, But a PHP driven script has been requested. To fix this issue, Have PHP added to the account in question. This question comes up from time to time regarding Wordpress and if we can host it. We can in fact host Wordpress. However we do not support Wordpress. What does this mean? We are simply the hosting providers, and will not include any web development support. What Information Should I Use For Database Creation? When first setting up Wordpress, You will be prompted to enter in your database information. This includes The database name, database username, database password, database host, and the table prefix. (If running multiple Wordpress installations). If you do not know your database name, username and/or password, Contact your ISP. When entering in the "Database Host" information, be sure to include 127.0.0.1, rather than localhost. What Is The Difference Between Database Name And Database Username? The two terms can be slightly misleading at first. Database Name refers to the actual name of the database. Database Username refers to the username that you use to authenticate to the database service. How do I add a redirect? How do I enable indexing? The directory will now be browsable.